We talk a lot about economic impact analysis here but the question of economic impact is only one part of a multifaceted reality. Researchers at the Michigan Department of Transportation had a different type of question. They didn’t want to just know about the jobs that could be created from constructing trails. They didn’t want to just know about tourism and retail spending that comes when people ride bikes or walk on those trails. They wanted to know what impact the trails had on people’s health. Did trail users spend less money on health care-related issues? Did expenses related to strokes and heart disease decrease? Did people end up missing less work because they frequently rode their bikes on the trails? Standard input-output analysis wouldn’t be able to give them the answers they sought. It could tell them the direct, indirect, and induced impacts. In other words, it could tell them the value of the supplies needed to construct the trails, the jobs created to build a trail, and the money flowing into the economy when those workers hired for those new jobs spend their paychecks. It’s the type of analysis that forms the foundation of IMPLAN and often, this type of analysis is used by local governments to make the case for public investment. 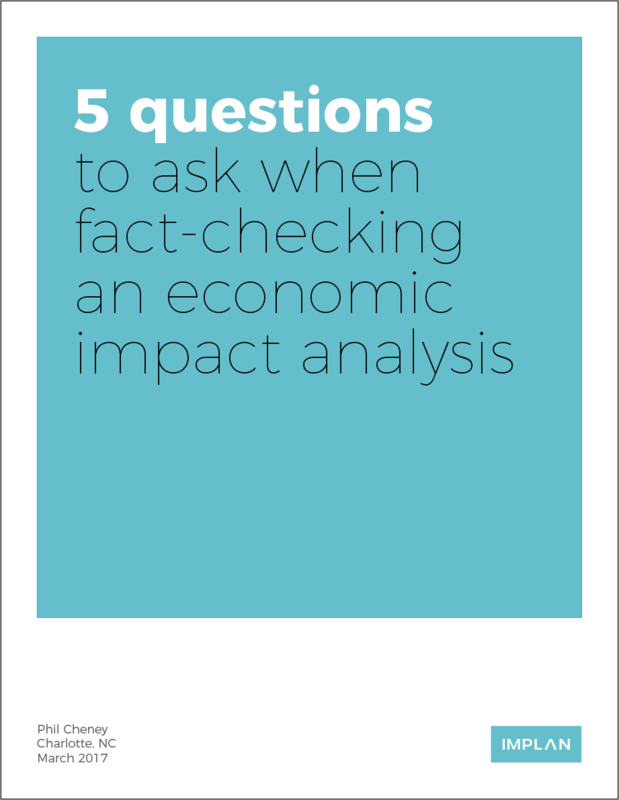 If a local government wanted to build a bridge and justify the cost of that investment, for example, it would hire an economist to conduct an input-output analysis. By talking to engineers and construction companies, the economist, according to Investopedia, would estimate how much the bridge would cost, the supplies needed, and how many workers would be needed. The economist then would convert this information into dollar figures. The subsequent results of the input-output analysis would reveal the direct impacts: the value of the raw inputs like cement and steel. It would also tell the economist the indirect impact, or the the jobs created to the cement and steel companies. The induced impact would be the amount of money the new bridge workers spend on goods and services. But, like many people who want to dig deeper into their economic projects, the Michigan researchers’ analysis stretched beyond those three main areas. Just like how an input-output analysis shows how a change in one sector of the economy can have a ripple effect on another sector of the economy, project analysts often search for a way their economic project has a ripple effect on communities, people, or the environment. For the Michigan researchers, their questions centered on people’s health. So the researchers turned to what is known as a satellite account to get the answers they sought. A satellite account get its name because it isn’t part of the standard Input-Output Analysis framework; it’s orbiting the direct, indirect, or induced impacts. “That’s the whole idea of a satellite account: it doesn’t actually enter the model itself, it takes the result of the model and translates it into something using a variety of tools,” Drew Varnado, product manager and economist at IMPLAN, said. The main thing that’s needed is a good translation. The results of the input-output analysis have to “talk” well to the satellite impact someone is trying to measure. If someone wanted to know about the carbon emissions a new coal-fired plant would produce, for example, they would have to know how many pounds of carbon a certain amount of investment in the coal industry produces. That connection is known as a corollary. And the more it is backed by sufficient research, the more sound the satellite account. “I don’t know how much environmental emissions goes with any one thing. But, for example, I may know that for every $100 put in this industry, it puts out one pound of carbon. So then when you know the direct, indirect, and induced impacts from IMPLAN, you use a satellite account to calculate carbon emitted from direct, indirect, and induced impacts,” Varnado said. These days, Varnado said, people using the IMPLAN input-output analysis are typically bringing their own corollaries. “This type of thing is commonly done to estimate social impacts from things like education, health, land and water usage, child labor, environmental impacts, and more,” he said. As long as it is backed by sufficient research, a satellite account can tell users a wide range of things. “You have to make the assumptions of both models talk to each other. In theory, if you have good enough research, anything can be a satellite account,” Varnado said. WHAT ELSE CAN YOU PLUG IN? Because a satellite account is anything tied to the output of a project, many things can be plugged in to measure impact. It’s become more common as people, especially government entities, look to explore the social impacts of some economic activity. “You are often tying some sort of social impact to a more concrete impact,” Varnado said. Environmental emissions have become more of a popular analysis. But Varnado also cited sociology papers where researchers are trying to measure the impacts of inner-city education programs. For every facility housing an inner-city education program that is built, some ask, how much would crime drop? For the Michigan researchers to develop their satellite account, they turned to numbers measuring the trail’s popularity. In addition, they looked to calculations for avoided health care costs for stroke and heart disease among bicycle riders. The two together served as the corollary, and could tell them how much people netted in avoided health care costs by bicycling on the trails. First, according to the published study, they estimated the annual number of hospitalizations from strokes and heart disease in the state or case study community using data from the U.S. Centers for Disease Control and the Michigan Department of Community Health. They then needed to find the total annual cost of each ailment in their study area. To do that, they multiplied the annual number of hospitalizations due to strokes and heart disease by the MDCH’s estimated direct and indirect costs of strokes and heart disease. Estimates from The World Health Organization helped them then multiply the total annual cost of strokes and heart disease in the state or case study community by the proportion of the conditions caused by physical inactivity. They then could tie that calculation to the direct impact of the study. They multiplied the cost for stokes and heart disease associated with physical inactivity by the proportion of Michigan residents in the study area who are physically active using their bicycle. To determine who was physically active on their bicycle, they used the number of residents who reported riding their bicycle two or more days each week in the study’s survey and the total population of the area analyzed. Of course, the more research behind the corollary, the better. This satellite account had a lot of data to back it up, but there were some shortcomings. The analysis, the study points out, assumes that no bicycle commuters would contract the diseases analyzed, meaning the estimates are likely high. In addition, data collected from the survey wasn’t strictly a scientific, random sample. Still, the study did produce some meaningful results. The researchers revealed that bicycling in Michigan generates $224 million annually through retail spending, manufacturing, and event and tourism spending. But, through the satellite account analysis, they also reported that the improved health of those who commute to work by bicycle in the state came back with an even bigger number. Those who commute via bicycle are associated with up to $256 million in avoided annual health care costs. The analysis could bolster a growing effort in Michigan to connect more communities and pave the way for more trails in the state.